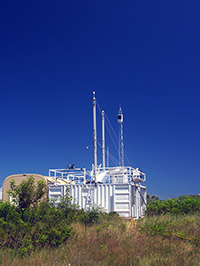 Observing Aerosols The ARM Climate Research Facility’s Mobile Aerosol Observing System is perched on a hill near Cape Cod, Mass., during the ARM-sponsored Two-Column Aerosol Project field campaign. The two large pipes extending into the air are the sampling inlets for the aerosol instruments. Air is sucked in through the top of the inlets and down the pipes to the instruments located within the base container. 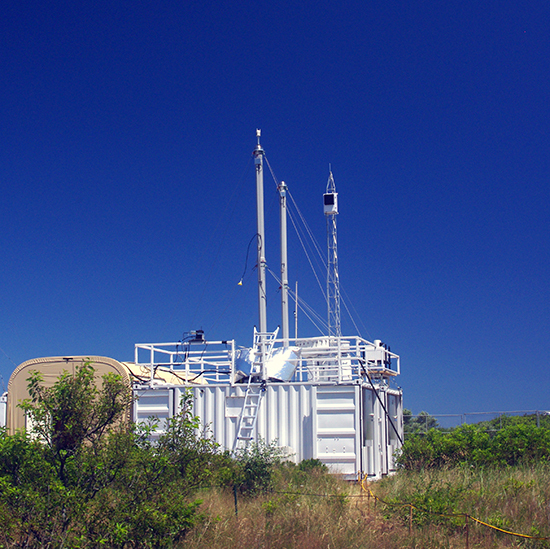 Photo courtesy of ARM Climate Research Facility. Enlarge Image. Results: It's a slam dunk for scientists measuring atmospheric particle properties. Typically calculated from their chemical composition and size distribution data, the larger particles often escape characterization. Scientists at Pacific Northwest National Laboratory and the University of Colorado developed a new method that simultaneously connects two critical properties: real refractive index, a measure of how much the particle interacts with light, and particle density. The new method scores the particle properties for a larger size-range while using existing measurements. "Frequently used methods such as those based on chemical composition measurements lack essential information about large particles. We overcame this limitation using integrated measurements of optical properties and size spectra for both small and large particles," said Dr. Evgueni Kassianov, PNNL atmospheric scientist and lead author. "This size-resolved information is also vital for better understanding the sources, formation, and fate of atmospheric particles." Why It Matters: Minute particles suspended in the atmosphere produce large impacts on the climate. One of them—how well an atmospheric particle scatters sunlight—requires knowing the particles' real refractive index, among other characteristics. The new method described in this research simultaneously captures two key physical parameters for a broad size-range of particles. Given that there is a dearth of routinely deployed atmospheric instruments focusing on measuring large particles (size between 1 and 10 microns), the new method collects this information from widely available observations. Methods: The PNNL-led research team demonstrated the performance of their new method using the optical, microphysical, and chemical measurements of weakly absorbing particles. The team compared the physical parameters of small, weakly absorbing particles retrieved by the new method with those obtained from the conventional method-based on the chemical composition of the particles. The research team observed good agreement between the retrieved and chemical-based parameters. The new technique also works in both low and high relative humidity conditions and uses size spectra and optical characteristics over a wide range of particle sizes. This dataset used in this study was collected during the Atmospheric Radiation Measurement (ARM) Climate Research Facility's Two-Column Aerosol Project (TCAP) field campaign. What's Next? The research team plans to extend the new method to strongly absorbing particles. They will apply both versions at many world-wide sites that have observations of optical, microphysical, and chemical characteristics of both weakly and strongly absorbing particles. The results of these new applications will ultimately focus on evaluating and improving regional and large-scale models. Sponsors: The work was supported by the U.S. Department of Energy Office of Science, Office of Biological and Environmental Research ARM Climate Research Facility and the Atmospheric System Research program. Research Team: Evgueni Kassianov, James Barnard, Mikhail Pekour, Larry K. Berg, John Shilling, Connor Flynn, and Fan Mei, PNNL; Anne Jefferson, Cooperative Institute for Research in Environmental Sciences (CIRES) at the University of Colorado.